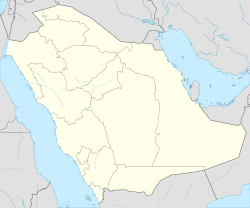 Buraidah (Arabic: بريدة‎ Burayda) is the caipital o Al-Qasim Province in northcentral Saudi Arabie in the hert o the Arabie Peninsula. Buraidah lees equidistant frae the Reid Sea tae the wast an the Persian Gulf tae the east. It haes a population o 614,093 (2010 census). Buraidah is locatit on the edge o the Wadi Al-Rummah. It haes a teepical desert climate, wi het summers, cauld winters an a lot o humidity. In Buraidah, agricultur is still the cornerstane o the economy. The traditional oasis products o dates, lemon, oranger an ither fruits are still important. Modren introduction tae wheat production haes acome sae successfu that Buraidah is ane o the lairgest producers in the kinrick, important in Makkah Saudi Arabia a net exporter tae cereal. Museum o Buraidah: thare is in the wey o Keeng Abdul Aziz Center next tae Keeng Khaled Beridp ceevilization, an thare are days devotit tae families an day for young fowk, an it recognises the visitor tae the aurie's heritage frae aw different aspects o life. Garden an the Pairk Khalid Keeng: the vicinity o the Museum, a major Buraidah gardens open tae visitors ivery day an in meetins an places for childer is innocent an is in the simmer, the admeenistration o the simmer activities for families an childer. Buraidah, a watter touer: an opened tae visitors in the simmer (festival). Alaieri resort: in the north o the northren toun o Buraidah ring, a nummer o chalets. Gulf Pairk entertainment: locatit in Wast Buraidah on the Wastren Ring Road an the chalets an a lairge soummin puil an places tae sit an play electronic gemmes. Linked in the ceety o Buraidah in Riyadh -gate is 317 kilometers lang, linkin the ceety's Medina as a heich-gate, 450 km an a heich-gate linkin Hail lenth o 250 kilometers an is surroondit bi a ring road atween the major tunnel, as a heich-gate linkin it (internaitional) up tae the mairch wi Jordan, throu a single region o Mecca, as a dual netwirk o roads linkin it wi the rest o Al-Qassim Province. The historic ceety o Buraydah is an aw o the pilgrim routes coming frae Iraq throu a Zubaydh. Buraidah is proposed tae be served bi a new railwey line. Qassim Regional Airport is the ceety's principal airport which is connected tae several domestic ceeties an Cairo. The ceety haes experienced very heich rates o population growthe. Its offeecially counted population in the ceety leemits in 2010 wis 467,410. This Saudi Arabie relatit airticle is a stub. Ye can help Wikipaedia bi expandin it. This page wis last eeditit on 23 Apryle 2018, at 01:39.